If you own a pool table, you know just how important it is to have a great set of pool balls—a regulation set of pool balls that roll well and resist scratches. If you are currently in the market for such a set, the following information may prove very useful. 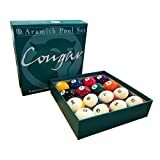 Here we have provided reviews for several of the hottest-selling and most trusted pool balls sets on the market today, and outlined the pros and cons associated with each one of these products. We have also compiled a Pool Balls Set Buyer Guide, in which we will explain the various factors and characteristics you should consider before purchasing a set of your own. What Is a Pool Balls Set? From cheap to premium billiard balls sets, these are our editor’s favorite options for any budget. The Aramith 2-1/4″ Regulation Size Crown Standard Billiard/Pool Balls are some of the most highly rated balls on the market. 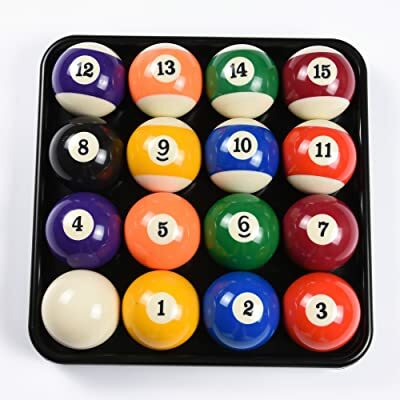 The complete set includes 16 top-quality balls, including 8 solids—the 1-ball through the 8-ball—7 stripes—the 9-ball through the 15-ball—and a cue ball. Each of these 16 balls is of regulation size and weight, measuring 2-1/4 inches in diameter. The pool balls are crafted from the highest quality phenolic resin, a material that provides incredible scratch and impact resistance—and what sets Aramith balls apart from the competition. The phenolic resin used to make the Aramith 2-1/4″ Regulation Size Crown Standard Billiard/Pool Balls is guaranteed to last up to 5 times longer than balls made of polymers or polyester. Aramith billiards balls are made to adhere to the strictest specifications in the pool industry, which ensures a set of billiard balls with superior playability and durability. Manufactured with precise roundness and amazing balance, as well as uniform weight and hardness, the brightly colored Aramith balls provide a friction resistant roll, making them ideal for billiard players of all skill and ability levels. Long lasting. Made of phenolic resin, the Aramith billiard balls are made to last 5 times longer than balls made of polymers or polyester. Regulation size. 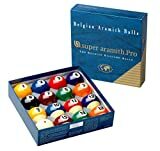 All of the Aramith Crown Standard Billiard/Pool Balls are of regulation size. Minimal felt wear. The Aramith 2-1/4″ Regulation Size Crown Standard Billiard/Pool Balls are friction resistant, which translates to longer felt life. Hard to see stripes. Some users of the Aramith 2-1/4″ Regulation Size Crown Standard Billiard/Pool Balls may find the stripes a bit hard to see. Premium priced. The priciest set on our list, the Aramith 2-1/4″ Regulation Size Crown Standard Billiard/Pool Balls are not for the budget conscious. The Grade A deluxe quality Iszy Billiards Pool Table Billiard Ball Set with Marble/Swirl Style is a full set of 16 balls—all of the solids and stripes, including the 8-ball, and the cue ball. All the balls are of regulation playing size—2 ¼ inch diameter—and regulation weight—6 ounces. 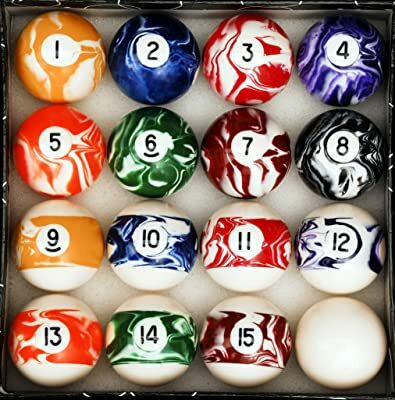 This beautiful set includes a unique marble swirl pattern on all of the balls except for the cue ball. Due to this design, the balls are sure to be a topic of conversation the next time you have friends over for a game. The Iszy Billiards Pool Table Billiard Ball Set with Marble/Swirl Style are made from a tough polyester resin that is made to last, and assures the best playing qualities, durability and longevity. Due to their accurate shape and size, and also to the traditional quality of Iszy Billiards products, you are sure to enjoy this set for many years to come. All of the Iszy Billiard balls are of the traditional color style used for pool balls, complimented with a handsome inscription in Art number style. High quality. Made from Iszy Billiards, this pool ball set is of the highest quality. Budget-friendly. The Iszy Billiards Pool Table Billiard Ball Set with Marble/Swirl Style is one of the most budget-friendly sets on our list. Deluxe Material. The Iszy Billiards Pool Table Billiard Ball Set with Marble/Swirl Style is made of deluxe materials for a superior roll. May leave marks. The Iszy Billiards Pool Table Billiard Ball Set with Marble/Swirl Style may leave marks on some pool table cloths. Can get scratched. After many uses, these pool balls can accumulate scratches. Not suitable for tournament play. Because of the marble swirl pattern, the Iszy Billiards Pool Table Billiard Ball Set with Marble/Swirl Style is not approved for tournament play. The standard-sized (2-1/4 inches) Empire USA Deluxe Pool Ball Set is made from a high-quality resin material that is sure to stand the test of time. Each of the 16 balls (stripes, solids, 8-ball and cue ball) is calibrated and polished for perfection. Expert players love these balls for their ultimate speed control, direction, rolling and striking force. The balls are very scratch and ding resistant, and are guaranteed to be of regulation size and weight—6 ounces. The Empire USA Deluxe Pool Ball Set is perfectly polished to ensure swift rolling so they move rapidly along your table with very little friction. Calibrated. All of the balls in the Empire USA Deluxe Pool Ball Set are expertly calibrated to ensure the proper size and weight. Polished. The balls, including the cue ball, in the Empire USA Deluxe Pool Ball Set are polished to perfection, guaranteeing a swift rolling ball. Scratch-resistant. The high-quality resin materials used to make the balls in the Empire USA Deluxe Pool Ball Set is very scratch and ding resistant. Can be heavy for novices. Novice players may find the Empire USA Deluxe Pool Ball Set a bit too heavy. Short return window. Those buying the Empire USA Deluxe Pool Ball Set online have a pretty short return window if they are not satisfied with their purchase. 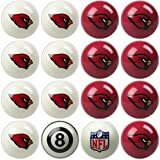 If you are currently in need of a top-notch pool balls set—a set that includes all 15 playing balls and the cue ball—you are sure to find there are literally hundreds of products and manufacturers vying for your business. But with so much information out there and so many products to choose from, how do you ensure you will get the very best pool balls set for your needs and your budget? Actually, buying the perfect pool balls set can be easy if you know what you’re looking for—and here we will outline some of the factors and characteristics you should consider when engaging in this process. 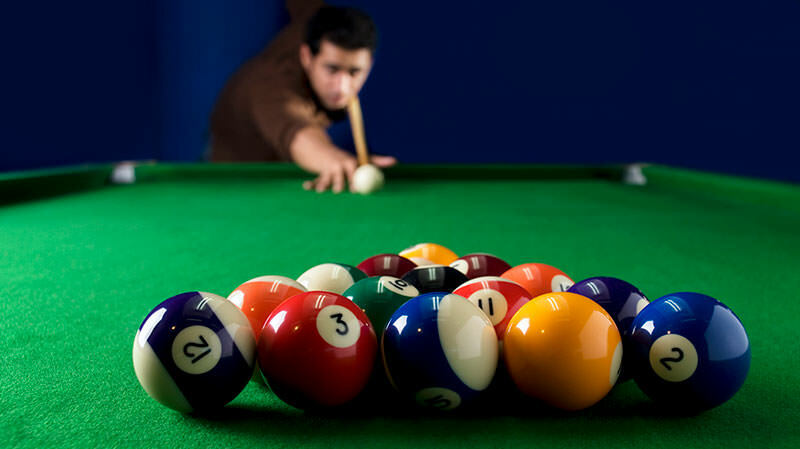 This may sound like an easy question to answer, but when you consider there are many different types of games played on a pool or billiards table, we thought we would take the time to briefly define the pool balls set as it applies to this guide. 8 solid-colored balls. There are 8 solid colored balls in a typical pool balls set. These solid-colored balls are numbered from one through eight, and are colored yellow, blue, red, purple, orange, green, maroon and black, respectively. 7 striped balls. The striped balls are basically white balls with a colored striped that goes around the circumference of the ball. These striped balls are numbered 9-15, and are colored yellow, blue, red, purple, orange, green and maroon, respectively. Cue ball. The cue ball in a pool balls set is pure white. It is colored this way so as to stand out from the rest of the colored balls, and to make it easy to see on the dark felt. Balls made from one of the many types of polyester resin are not as durable as the former. They tend to get overheated after several hours of play, and can lose their shape over time. They are also very susceptible to scratches, although these coatings have become more sophisticated lately. Standard pool balls have a regulation size. They are designed with a diameter of 2-1/4 inches and are made to weigh between 5.5 and 6 ounces. If you are buying pool balls to play a different type of billiards, however, the dimensions of the balls may vary from this. For instance, the balls for snooker have a diameter that is slightly smaller—2-1/15 inches—and they weigh in at about 4.9 ounces. And if rail billiards is your game, you’ll need balls that measure 2-1/2 inches in diameter, with a weight of 7-1/5 ounces. As we mentioned above, standard pool balls have a pre-ordained color scheme, with solid and striped colored balls and a white cue ball. These types of balls are always the type used for professional and amateur tournament play. 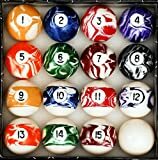 However, there are specialty sets in which the colors can change a bit—such as sets that have a “pink” 8 ball or a marble-swirl pattern (see the Iszy Billiards set above). 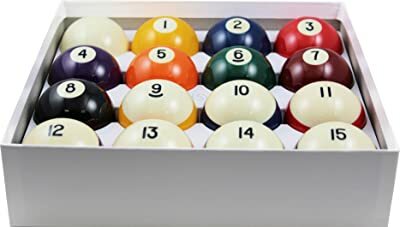 The exact color scheme is up to you, but if you plan to play tournaments it’s always good to have a regulation pool balls set at the ready.